RE: Spells - Read the first post! All Forums >> [Artix Entertainment Games] >> [AdventureQuest] >> [AQ Encyclopedia] >> Info. Submission >> RE: Spells - Read the first post! idk i thought its nice to get an estimation of what the items are. its useful until whenever IMR post her legit data. Call forth the Lagoon Leviathan to strike with a surge of water, sometimes dealing greatly boosted damage with tidal force! 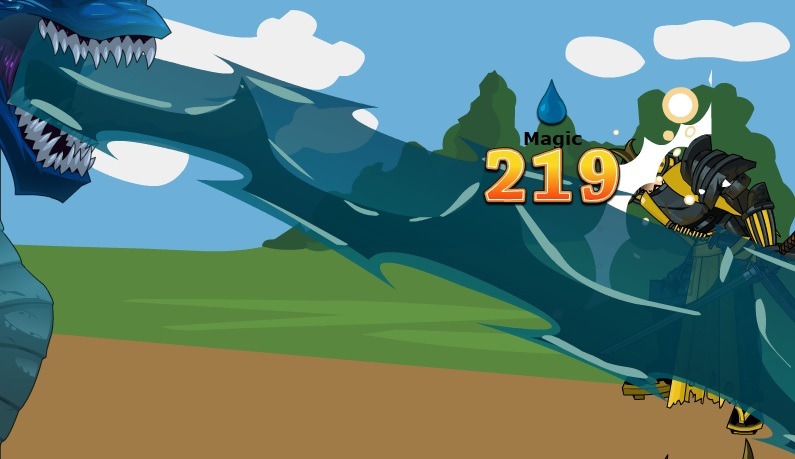 Water spell, MC is a 25% chance to deal +20% damage, striking with "tidal force". Has a 0.25 base lean. #hits? And is the bonus rolled per turn or per hit? Light spell, gives up MC and 100% Melee (or half of the spell's damage + MC, for a total of 110% Melee) to inflict 4 turns of -(55*LightRes*Hits/5/1.4)% damage Choke (renamed to Broken) for 4 turns, inflicting with INT/LUK and resisting with CHA/LUK (it's attempting to break your spirit). Spell does 3 hits of 1/6 damage, and then 2 hits of 1/4 damage. Gives you a status, Caltrops, that inflicts damage whenever the monster attacks. The effect is like Backlash, but the damage dealt doesn't depend on the monster's damage and the status only lasts 4 turns. Damage is equal to 0.5*(0.5 + 0.5*[YourDEX]/VStat) of an expected Melee attack. The save that the monster gets to resist the damage is done at a +0 bonus (inflict with DEX/LUK, resist with DEX/LUK). Caltrops have a bug, if you use the high level caltrop for effect and then the lowest level caltrops next round it just adds more to duration power stays same is like casting the high level caltrops at SP cost of lowest level caltrops. Melee skill. Cost is split between SP and HP. Five hits, Melee Darkness. +7 BTH lean. MC: If all 5 hits connect, then there's a (21.68*[Dark Resistance])% chance at Dazing the foe (1 round, 100% chance of not acting). The mob can resist with a save at a +0 bonus (inflict with STR/LUK, resist with END/LUK). Summon forth a powerful Kaiju to blast your foes with a powerful nuclear breath! This Kaiju is incredibly powerful, and crushes foes that are weak and without strength! Call forth a powerful Kaiju to blast your foes with a powerful nuclear breath! This Kaiju is incredibly powerful, and crushes foes that are weak and without strength! Call forth a collection of Grenwog eggs that will explode in your foe's face! The surprise from the eggs can leave your foe paralysed with shock! ***The shock and surprise from the explosion has paralysed your foe! ***Your foe is shaken by the sudden explosion, but quickly composes themselves. ***Your foe is immune to being paralysed. Light Melee spell. Costs SP. Has *1.5 Lucky Strike rate. Ranged Healing spell. Costs SP. Uses DEX/4 for damage. Healing is multiplied by the monster's Light resistance. It gets the *0.85 penalty for auto-hitting, but not the *0.9 "always useful" penalty. MC: 1/7 chance to give Celerity to your side of the field. Monster can resist with a save at a +0 bonus (inflict with DEX/LUK, resist with LUK/INT). Melee Light spell. Costs HP. Uses END in place of INT for stat bonuses. MC: Burns the monster (4 turns, power: 0.5). The monster can resist with a save at a +0 bonus (inflict with END/LUK, resist with DEX/LUK). Gives you the listed STR boost for 3 rounds. Gets less powerful as you level up, the same way as Moonwalker's Grace. What's up with the "431 SP"? Shouldnt warrior SPells cost 392? Only Standard skills at Level 150G have that cost, in this case the cost is dependent on the melee power of the Stat boost. 431/392 is 109.95% multiplied with 1.05*.85*200/(38.5+15*1.4*5/4.25) that gives 310.507/3 Str is close enough to 102 per turn. Water spell, pretty much a clone of Fruitcake Barrage from a few years back. Spell has a 100%*MobWaterRes*Hits/Attempts chance to attempt a 1 turn Paralyse, if it goes past 100% chance it has a (Chance-100)% chance to do 2 turns of Paralyse instead. It pays 59.5% Melee for this, or in other words, it pays 29.75% spell damage, adjusted to 24.75% due to MC. Inflicts with player INT/LUK, mob resists with STR/LUK (break the tentacles from holding you down) at a neutral 50% save. If your level is between [PowLvl] and [PowLvl+BUFFER], then there's no adjustment. Early updates, updated spells in the LTS. Two spells, both have a 0.15 base lean and a fully +10 BtH lean. MC effect on both is a further +4.25 BtH. The old spell did a single torch drop for 1 Fire hit (now does 2 hits) and then 3 stomps for 3 Earth hits. I'm making the file check the spell DB element and then it'll do the Fire or Earth parts of the spell as appropriate. So the Fire spell does 2 hits, the Earth spell does 3 hits. I can't help but notice that we still don't have proper info subs for the Kaiju Blast duo or the Loco Eggsplosion in this thread. This in addition to multiple other items from various categories that have been released and didn't get their info posted. Admittedly, I don't remember what they were off the top of my head but I'm pretty sure that there was a fair bit of things. Energy spell/skill, spell version costs MP and does Magic damage, skill costs SP and does Ranged damage. MC is that it triggers on foes with <= 0 STR, since this is the Kaiju itself crushing weaklings and such. Magic Fire spell, pretty much a clone of Fruitcake Barrage. Has a 100%*Hits/Attempts chance to attempt a 1 turn Paralyse, standard Paralyse effects based on resist and such. It pays 59.5% Melee for this, or in other words, it pays 29.75% spell damage, adjusted to 24.75% due to MC. Location: Given automatically to players who purchase the 7,500 Z-Token Package. 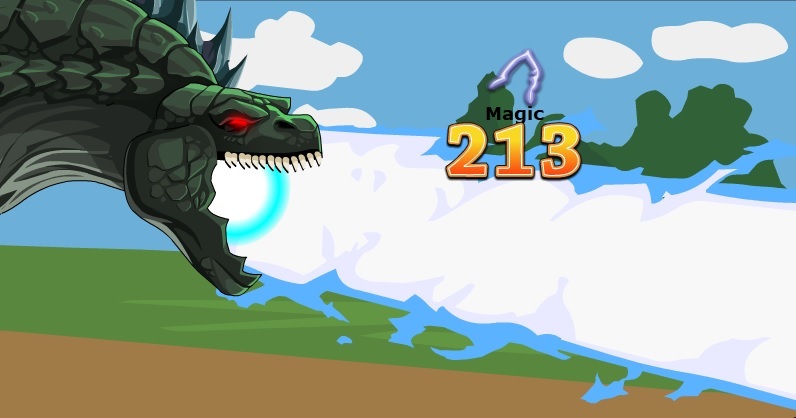 The version of the spell is based on the level of the character. Buying the promo item also gives access to the Buffalot's Beach Bod Shop. Gives you the listed STR for 3 turns*. NOTE: Numbers below assume PlayerLvl=SpellLvl. Mage Mark Buffalot used this spell to turn himself into an incredible hunk! Now you can use it to give yourself a temporary boost your STR. Requires green gamma magic (SP) to cast and does not consume a turn. Numbers thanks to In Media Res. Release date thanks to Carandor. June 28, 2018: The spell was released. MC Light spell. 14 hits, -6 BTH lean. Deals -50.3% damage and has a 15th hit. This does 0 damage, but if it connects, it'll Daze the monster ([50*LIGHT]% stun chance, 4 turns). The monster can resist with a save (inflict with INT/LUK, resist with END/LUK). Direct clone of Buffalot but boosts INT. Does NOT give any boost to MP, just boosts damage dealt with Magic weapons/spells and such. Location: Given automatically to players who purchase the 7,500 Z-Token Package. 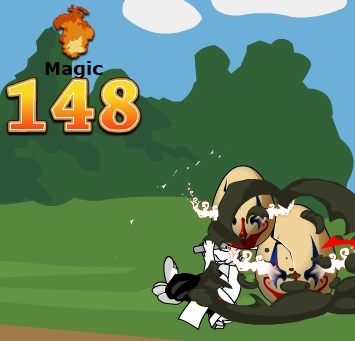 The version of the spell is based on the level of the character. Buying the promo item also gives access to the Arcane Amplification Shop. Gives you the listed INT for 3 turns*. Does NOT give any boost to MP, just boosts damage dealt with Magic weapons/spells and such. *You can see the essence of the universe now! This spell lets one focus their mind to enhance their magical powers! It requires focusing cosmic energy (SP) within yourself, and does not cost a turn to use. Numbers thanks to Kamui and In Media Res. September 1, 2018: The spell was released. It seems like the only spell that doesn't have its info subs posted in this thread is the Darkness Orb Shroud, IMR. See the weapons thread for more details. MC spells, two different spells, one Darkness and one Earth. Costs 50% Melee in SP and 50% Melee in MP, since I'm assuming this'll be used on a Hybrid character. The spell gets half stats from STR and half from INT for damage, and replaces INT/DEX in BtH calcs with INT/STR. MC effect is the fact these are hybrid spells. Quick-cast spell, gives you +18 BTH for 5 rounds. Not stackable. Comes in MP+INT and SP+STR variants. The boost is multiplied by (0.5 + 0.5*([YourINT|STR, caps at VStat*1.1]/VStat)) plus the usual outlevelling penalty (without any buffer). This quick-cast «spell/skill» brightens your outlook for the coming year, and has the nice side effect of increasing your accuracy for the next few turns!